Reinbek bei Hamburg: Rowohlt, 1989. This paperback edition is the first German publication of The Fly on the Wall. Tony Hillerman's original text was translated from English into German by Hubert Deymann. 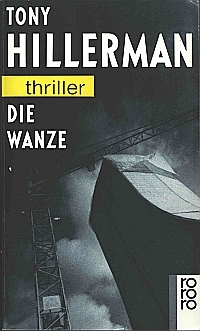 Tony Hillerman | Die Wanze | Deutsch von Hubert Deymann | [publisher's logo] | Rowohlt. Binding: Heavy paper cover printed in black with 2-color illustration on the front.